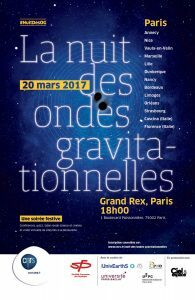 On March 20, 2017, the CNRS and the Société Française de Physique organize “The night of gravitationnal wawes” in fifteen cities in France and Italy, an event supported by Labex UnivEarthS. With scientific conferences, virtual tours of laboratories, a quiz and a projection of excerpts of commented films, this event open to all celebrates the discovery of gravitational waves announced in February 2016. The Night of Gravitational Waves will be an opportunity for high school students, students and all those curious about science to come and learn about this major scientific discovery, during a great festive evening that will be held simultaneously in 15 cities in France and 2 Cities in Italy: Paris, Annecy, Bordeaux, Dunkirk, Limoges, Lyon, Marseille, Lille, Nancy, Nice, Orleans, Strasbourg, Cascina and Florence. No prior scientific knowledge is required. In each of these cities, the evening will begin at 6:30 pm with a scientific conference: in Paris, at the Grand Rex, it will be hosted by Alain Cirou, editor of Ciel & Espace, partner of the event. Then, around 8:15 pm, all the sites will be interconnected by video: animated live from the Grand Rex by the author and actress Florence Porcel, this second part of the evening will start with a live visit of the control room from Virgo to Cascina (Italy). The CNRS teams, as well as those in Italy and the Netherlands, who are working on the launch of Virgo, have also contributed to the discovery of gravitational waves by US colleagues from the Ligo experiment.